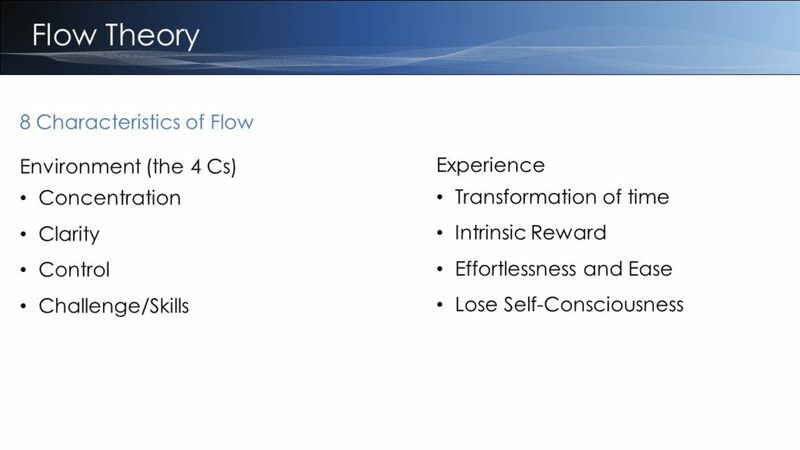 We cannot MAKE someone experience Flow. I think we approach many of our change initiatives the wrong way. We seem to be focused on changing behavior. We don’t ask whether what we are doing is going to help provide the environment to encourage that behavior change. Can they concentrate? How many other activities are you having people do at the same time? Is it additive? Are you subtracting ANYTHING? Or is it just “MORE.” How much “multitasking” are you asking people to do? Have you provided them clarity or at least a sense of direction? How often does your goal change? Do your changing goals, combined, lead somewhere – or are you still running in circles? Do your people have any chance of succeeding? Will they have some semblance of control over the new tasks? My assumption is that you hired them because they know what they are doing or can learn quickly. Are you giving them the space and the time to learn new skills so you can take on new challenges? Are you complaining that your workers don’t have the skills, then not investing in the people you have? How much is it costing you to attract, recruit, and onboard new workers who come in with the skills? How much productivity are you losing as you onboard your new employees (because that takes resources from your existing employees)? We can’t force anyone to internally experience anything. Why not focus on creating the right environment? Let me help you visualize your work-in-process! Subscribe to the newsletter and I will send you a free PDF to help you with personal prioritization. I hope you can join me on this journey!